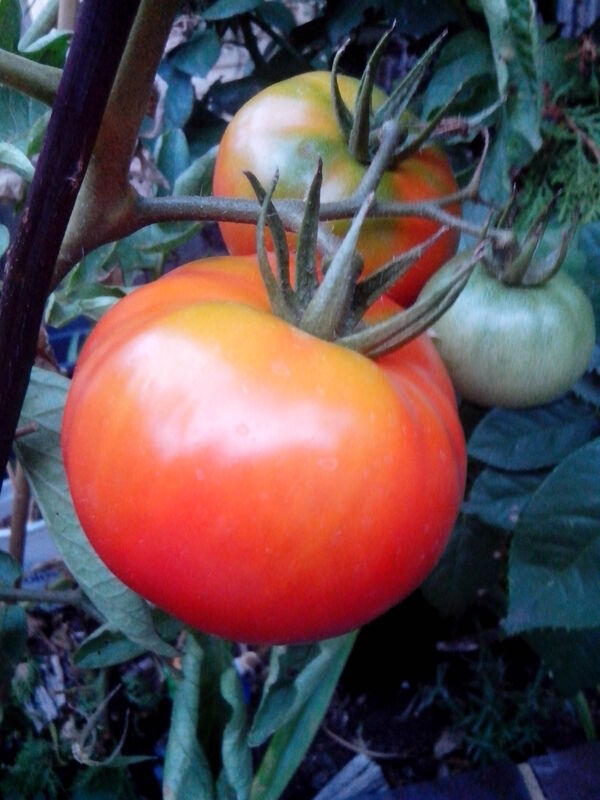 The tomatoes are growing bigger in the garden and some are ripening and I look forward to the bounty of summer for making tomato sauce for pasta, lasagna, pizza and parmigiana dishes. The tomatoes in this sauce are oven roasted so their flavour will be enhanced. Once prepared and in the oven you will find that this is a really easy way to make tomato sauce. Properly done, the tomatoes will not stick to pan and the sauce can be frozen for use over an extended period. some contain more moisture and will take longer to cook. I have successfully made this sauce using halved cherry and grape tomatoes. 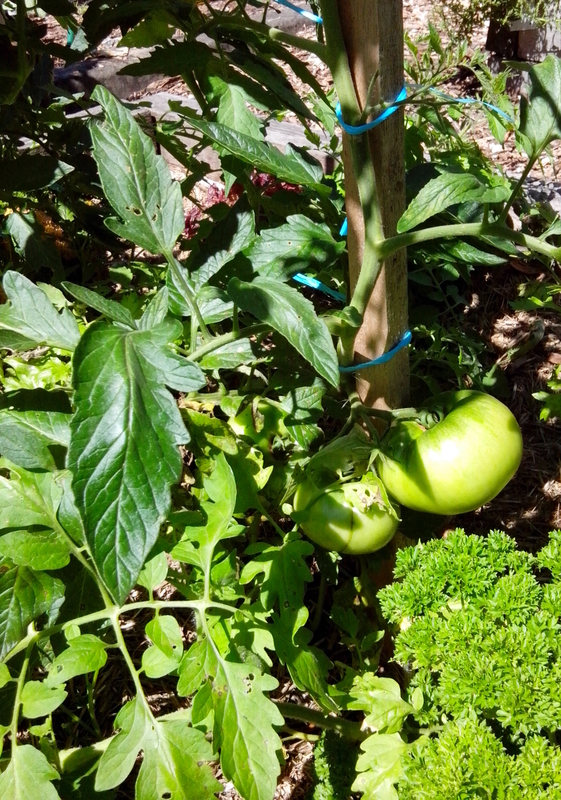 Give it a try and I will wager that you will never make tomato sauce on the stove top again! 1 small carrot, washed scrubbed used whole to counter the acidity of the tomatoes. a good splash of dry red wine to over the top of the tomatoes for some cooking liquid. (about 1/2 cup) or use some water in place of the wine if you wish. Add garlic clove/s,chopped onion, and drizzle the rest of the olive oil over the tomatoes, and toss the mixture well using your hands. Place the baking dish in the oven uncovered and cook for about 40-60 minutes or until the tomatoes have reduced down and softened and liquid has evaporated. The moisture from the tomatoes will usually be enough to moisten the sauce but if needed add a little water and stir to prevent the sauce from catching. 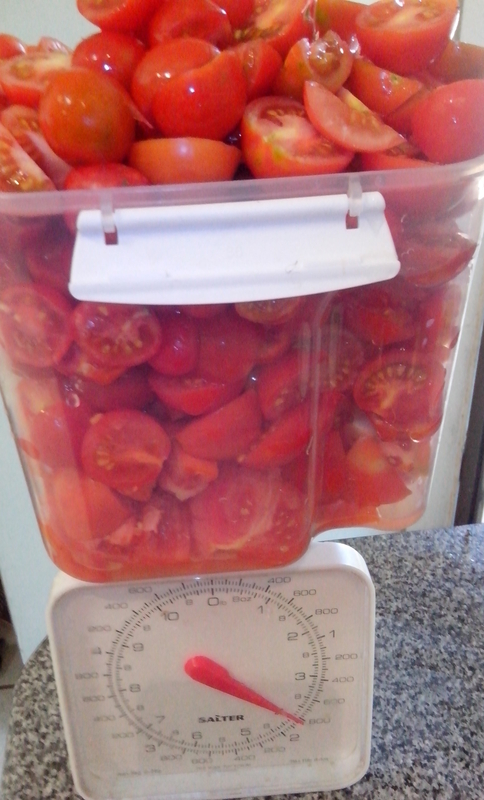 The tomatoes should be done when they have softened and the liquid is well absorbed. When cooked remove from the oven and set aside to cool for about 5 minutes. Remove the carrot, then put batches of the sauce into a pyrex measuring jug or similar jug and use a stick blender, applying short bursts to blend the tomatoes into a sauce. Remember that the sauce should have some texture so do not over-blend. Just 2-3 bursts will be enough. Empty the blended sauce progressively into freezer safe containers in quantities that will be suitable for your family needs. When cool the sauce will be ready to use. Refrigerate or freeze for further use. You can also add chopped capsicum or chilli to this basic recipe to vary it. The sauce is delish! And I made about 5 litres…. Next on the list is that zucchini cake.